Is this colour shift normal? I have been playing with a K series50mm 1.4 on the Q and am finding a significant colour shift between using it wide open(1.4) and at f5.6. Checked M501.4 and M 50 1.7 and they also do it. I turned AWB off and it still happened. The difference is visible on camera. The K30 doesnt appear to do it. The yellow Kowhai buds are jpegs ex camera. 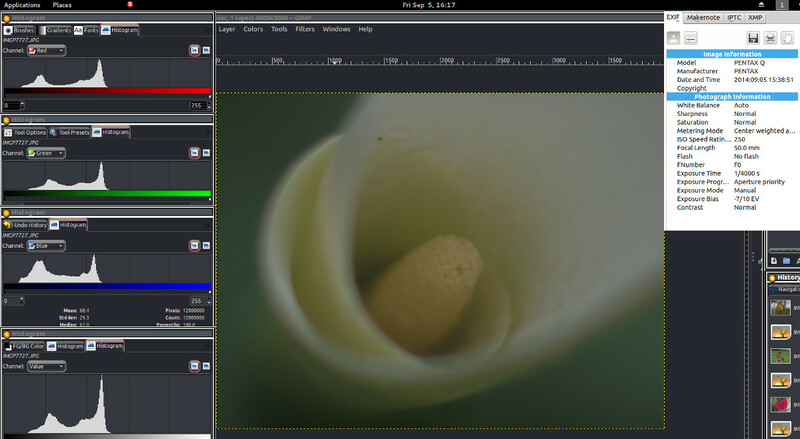 And the screenshots are from gimp showing the various histograms and I tacked on the exif data from digikam. The green channel seems to have changed the most. Have I got a setting out somewhere? Most lenses (specially older ones) won`t give much contrast when used wide open. 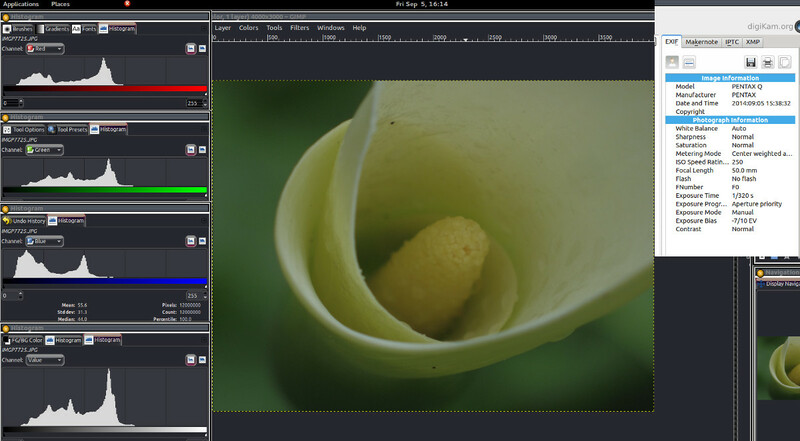 Also, the f/1.4 image seems to be a little missfocused abd that will reduce contrast further. Increased contrast makes colors look more saturated and brighter. Not like the contrast slider on PP software but the contrast the lens can produce (related to sharpness, I think it`s called micro-contrast). This is loss of midtone contrast from a fast lens wide open. Quite normal. On page 23 of his book titled Complete Digital Photography, 3rd Edition, Ben Long talks about similar situations. The very small sized photo sites (pixels) are hard pressed to deal with large amounts of light thrown at it when you open that lens up. “If too much light hits a particular photosite, it can spill over into adjacent photosites. If the camera’s software isn’t smart enough to recognize that this has happened, you will see a blooming artifact- smearing colors of flared highlights- in your final image. 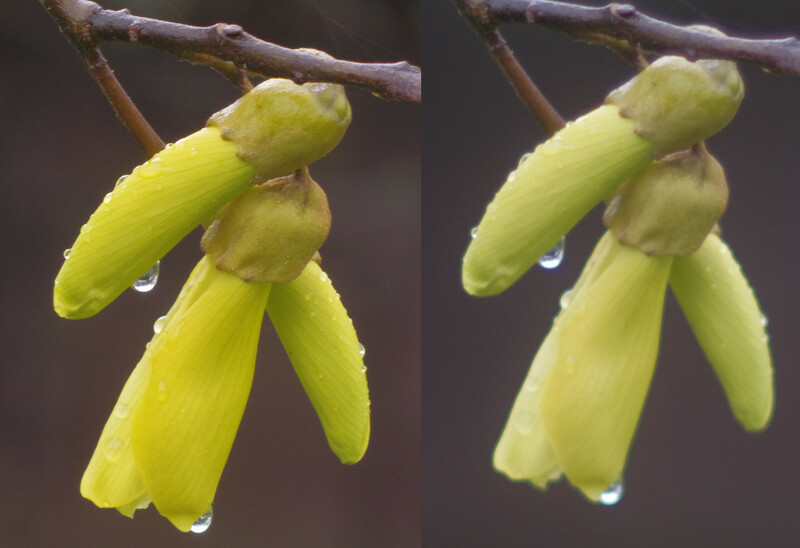 Blooming is more prevalent in a physically smaller image sensor with higher-resolution because the photosites are packed more closely together. “ He goes on to talk about other issues with the small sensors. From my testing of the Q then the Q10 and now working with my Q7 I feel that the original sensor would have produced better images if it had been built as a 8MP or at most 10MP sensor. By cramming 12.4MP into the small sized sensor of the Q and Q10 Pentax had to make some serious compromises on the image quality and while they do sell an adapter, I seriously doubt that one of their design considerations was using K lenses. It would be interesting to see if you get the same results with a Q7 which sensor size may be more forgiving. Creeping up from the bowels of my memory bank, I believe I recall reading that someone flat coated the inside of their adapter in an attempt to remedy such an issue. Thanks for that Carrrlangas. But why not on my K30?. I feel it is a little more than the effects of softness. I think Denny might be more on to it -- it would explain why the k30 is fine with pixels 3 x the size. Can anyone repeat what I am experiencing.? Last edited by GUB; 09-05-2014 at 02:26 PM. When they talk about quality of photo sites the size they are referring to is the actual size of the individual photosite, Your K30 has a 16MP APS-C sensor which is about 15 times larger than you Q’s 12.4MP 1 / 2.3 sensor. Therefore the individual photosites in you K30 sensor are significantly larger than those in your Q sensor. That is one of the reasons I said that Pentax would have been better off if those original sensors had been 8-10MP. Check out this site to see a visual comparison of the two sensors. In doing my model railroad photography with the Olympus I was getting substantially better depth of field than I had ever gotten with 35mm film. (A link to a presentation of Harold Sheltons Black Canyon Model Railroad that was shot with that Olympus camera can be found on the Home Page of my WEB site.) At that time, 2002, I got into an email conversation with a guy in Australia who was one of the engineers responsible for development of that sensor. Over about six emails he explained to me some of the basic concepts of photosites and sensors and why I was achieving such great depth of field at f8-f9. At the time he predicted that the most MP a sensor of that size could hold would be around 4MP at which point the sensor would have to get larger and he knew that larger sensors were already being developed. Fast forward about 10 years and Pentax is cramming 12.4MP into a similar sized sensor. You can make your own conclusions. I tried the Q and then the Q10 to see if I could get the same depth of field I had been getting out of that Olympus but found the image quality a bit lacking. While it does ruffle some feathers, I find the Q7 image quality to be substantially better hence I was wondering how your lens would do on that version. + The lenses used projects a much larger image than the Q sensor area so all that extra light is bouncing arround the K-Q adapter, sensor and lens rear element. + Stop down lens. I`d try f/3.5 or F/4 to avoid heavy diffraction degradation and light reflecting off the aperture blades at smaller aperture values. Yeah after taking better examples it was visible to a lesser extent in the k30. So that puts a lot of blame on the lens. I tested the Q again in interior lower light where there should be so much light overflow on the pixels and it still did it to the same extent. The interior surfaces of the K50 maybe be the guilty party. I expect the loss of contrast, It was the colour shift that bothers me.